This is the actor playing Magnus in the upcoming Mortal Instruments movie. 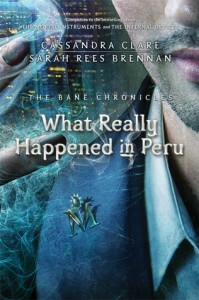 Isn't he lovely?Two words about What Really Happened in Peru :FunForgettableThis is a short story which takes place pre-Mortal Instruments. As many short stories go, it's not much more than just a collection of brief extras, showing Magnus in a few adventures while out on his own. You will not have needed to have read either the Mortal Instruments or the Infernal Devices series in order to read this, but I don't see why the story would be all that interesting to anyone who doesn't already have a love for Magnus. As well, there are brief mentions of characters from other series (not having to do with the story, however), that might fly right over your head if you don't know who they are from reading the companion books. If you can't get enough of Magnus, you'll enjoy this collection of short stories. Otherwise, don't feel pressured to have to read this. It's not a "have-to" in order to keep up with the world. Not that I was complaining about having to spend time with Magnus or anything..."Magnus, you were trying to flirt with your own plate." "I'm a very open-minded sort of fellow!"